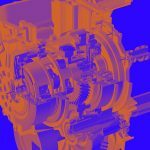 An investigation of the low-cycle bending fatigue of spur gears made from AISI 9310 gear steel was completed. Tests were conducted using the single-tooth bending method to achieve crack initiation and propagation. 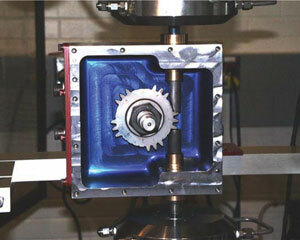 Tests were conducted on spur gears in a fatigue test machine using a dedicated gear test fixture. Test loads were applied at the highest point of single tooth contact. Gear bending stresses for a given testing load were calculated using a linear-elastic finite element model. 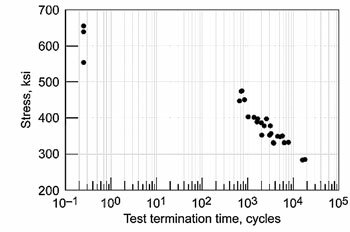 Test data were accumulated from 1/4 cycle to several thousand cycles depending on the test stress level. The relationship of stress and cycles for crack initiation was found to be semi-logarithmic. The relationship of stress and cycles for crack propagation was found to be linear. For the range of loads investigated, the crack propagation phase is related to the level of load being applied. 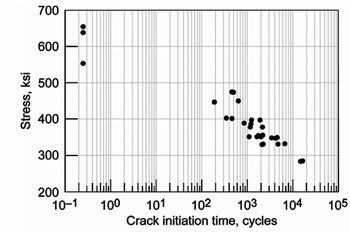 Very high loads have comparable crack initiation and propagation times whereas lower loads can have a much smaller number of cycles for crack propagation cycles as compared to crack initiation. 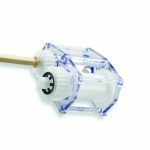 In certain space applications of gears, the level of loading applied to the gear mesh members can be large enough to cause a great deal of the gear’s life to be used in a short number of cycles. 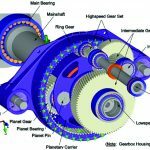 The American Gear Manufacturers Association (AGMA) standard for evaluating fatigue of gears (ref. 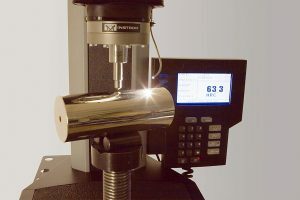 1) states: “The use of this standard at bending stress levels above those permissible for 10,000 cycles requires careful analysis.” In the AGMA standard, the stress-life relationship for the cycle regime comprising 100 to 10,000 cycles is depicted as a single value for the allowed bending stress. Thus, the problem is how to properly account for severe loads to estimate the fatigue lives of gear teeth. The standard’s analysis techniques calculate a life at a given stress for 99 percent reliability at the component level. This means that a large population of components designed using the allowable stress values should experience crack initiation at a rate no greater than 1 per 100 for the given cycle count. To provide a credible estimate of fatigue life at 99 percent reliability, extensive experimental data is required to establish the load-life relationship in the low-cycle fatigue (<10,000) regime. 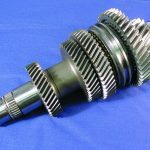 Published experimental data for the fatigue of case carburized gears for loads sufficient to fail the gear in the range of hundreds to several thousand cycles is sparse (refs. 2 and 3). 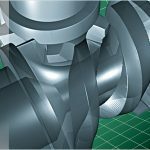 At gear loads that can fail a gear within several thousand cycles a certain degree of non-linear material response is taking place since the bending stress calculated at the fillet radius-root region of the tooth exceeds the material yield strength. The tensile yield strength of the carburized case layer is estimated to be 295 ksi (2.03 GPa) (ref. 4). 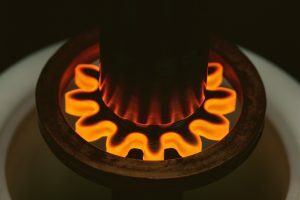 Therefore, linear-elastic-based gear stress analyses should be considered as providing stress-based indices of loading intensity (pseudostress) rather than as representing the true stress condition of the material. In certain space mechanism applications a limited number of extremely high loads can be imparted to the gear system components. The effect of these high loads on the life of the mechanism needed to be answered. Therefore the objective of this work was to assess experimentally the low-cycle bending fatigue of spur gears made from case-carburized AISI 9310 steel. Tests were conducted using a commercially available fatigue test machine with a special fixture specifically designed to load the test gear tooth at the highest point of single tooth contact. The test gears used for this work were manufactured from AISI 9310 steel. The nominal chemical composition of the AISI 9310 material is given in Table 3. 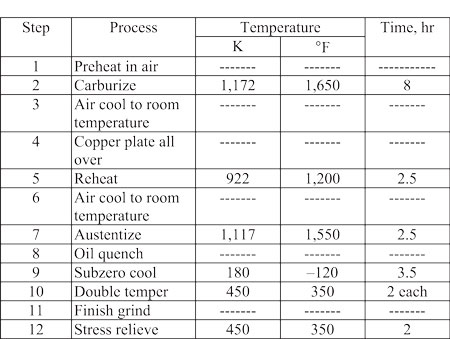 The gears were case carburized and heat treated according to Table 2 . 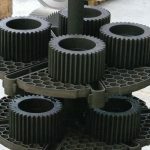 The nominal properties of the carburized gears have a case hardness of Rockwell C60, a case depth of 0.038 in., and a core hardness of Rockwell C38. The manufacturing specification for the test gears required use of consumable-electrode vacuum-melted material. 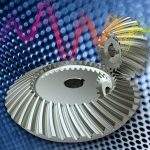 Post-test metallographic inspections of test gears revealed levels of inclusions higher than would be anticipated for such material. Inspections of failed surfaces show that fatigue was a surface-initiated phenomenon, and therefore it was judged that the higher than expected level of inclusions did not degrade the fatigue performance of the gear teeth. The dimensions for the test gears are given in Table 3 . The gear pitch diameter was 3.5 in. and the tooth form was a 20° pressure angle involute profile modified to provide a tip relief of 0.0005 in. starting at the highest point of single tooth contact. 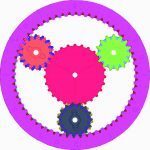 The gears have zero lead crowning but do have a nominal 0.0005 in. radius edge break at the tips and sides of the teeth. 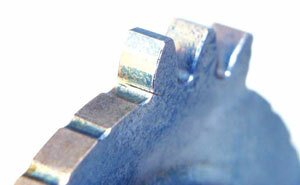 The gear tooth surface finish after final grinding was specified as a maximum of 16 min. rms. Tolerances for the gear geometries were specified to meet AGMA (American Gear Manufacturers Association) quality level class 11. Gears manufactured to these specifications have been used at the Army Research Laboratory and the NASA Glenn Research Center for gear experiments including contact fatigue (refs. 4 to 6), gear wear (ref. 7), loss-of-lubricant performance (ref. 8), gear crack propagation paths (ref. 9), and health and usage monitoring (ref. 10). The fatigue test machine used for this investigation was a servo-hydraulic test system with 20,000 lb. load capacity. With the exception of the gear test assembly, the test system was in standard configuration for fatigue testing smooth shank, cylindrical specimens. The load mechanism features an alignment fixture that can be used for closely controlled positional and angular adjustments. The 20,000 lb load cell is positioned between the alignment fixture and the top grip. The output from the load cell can be used for control purposes and/or simply monitored as required by the test program. The gear test assembly is mounted in the load frame using a support arm which is attached to the two-post load frame. The bottom grip is attached to the actuator which serves to power the system using 3000 psi oil supplied by a central hydraulic system. An AC type linear variable differential transformer (LVDT) is attached to the base of the load frame and used to measure actuator displacement or stroke. As in the case of load, stroke output can be used for test system control and/or simply monitored as required by programmatic needs. Key details of the gear test assembly are shown in Figure 1, Figure 2, Figure 3. The gear test specimen is positioned on a shaft which is a press fit in the fixture’s casing. The test assembly was designed to conduct tests on gear teeth in sets of three. This approach was adopted in part to provide the necessary clearance for the two load rods. To permit access to the gear tooth to be tested several teeth nearby needed to be removed. Teeth were removed using the Electrode Discharge Machining (EDM) process. The upper load rod contacts the reaction gear tooth near the root of the tooth. In contrast, the lower load rod contacts the test gear tooth at the highest point of single tooth contact. Adopting this approach, highest bending stresses are introduced into the test gear tooth and the location of fatigue failure is predetermined with a high degree of confidence. The rotational orientation of the test gear is precisely established using setup tooling. The rod that loads the test tooth at the highest point of single tooth contact is representative of a rack gear (flat profile or infinite radius of curvature) contacting the test tooth. The various stages of fatigue crack growth can readily be observed through the viewing port provided. Figure 3 shows the test fixture ready for operation. During installation of the gear test assembly, extreme care was taken to ensure that the load rods were in exact alignment with the load line of the test system. Furthermore, the test fixture was designed such that the load line of the test system is tangent to the nominal involute base circle. Use was made of the clearances between the various bolts and bolt holes to make the necessary positional and angular adjustments. When proper alignment was achieved, both load rods moved freely in their respective bushings and exhibited minimum friction. 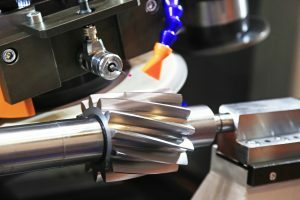 A check of the performance of the fixture alignment was made using “machinists dye” (bluing) applied to the gear tooth profile prior to testing. The dye removal created by the load rod contact areas gave a clear indication that uniform load distributions on both gear teeth had been achieved (Figure 4 ). The contact pattern procedure was followed in all tests with excellent results, and the contact pattern data were recorded photographically and stored for quality assurance purposes. The single tooth bending tests of this study were conducted using unidirectional loading. Testing was done in load control. The gear was positioned to provide load on the test tooth at the theoretical highest point of single tooth contact for the case of the test gear mating with an identical gear at the standard center distance. The load is cycled from a small, minimum load to the maximum load desired for the given fatigue test. The load range was maintained a constant value throughout the test. Loading was cycled at 0.5 Hz using a sinusoidal waveform. A typical load waveform is shown in Figure 5 . For the testing conducted in this study crack initiation was assumed to occur when the loading rod stroke increased approximately 2 percent (.0002 in. change) relative to the stroke for the gear tooth at test initiation. At this point a crack had initiated with a size on the order of the case depth. The test was continued until the rod stroke was 0.010 in. greater than that achieved on the new gear tooth. At this point the crack size was visible on the side of the tooth and was approximately 30 to 50 percent of the distance across the tooth thickness at the tooth base. To determine the extent of the crack face at the middle location across the tooth face width would require post-test removal of the tooth. An example of one of the test specimens is shown in Figure 6 at the test termination cycle limit. In order to relate the normal load applied in the test to the fillet–root stresses that the loading would induce, a finite element model of two identical gears as shown in table 3 operating at a standard center distance was analyzed via a specialty code developed for gears (ref. 11). The FEA modeling requires selection of the radius of the tip of the hob that made the gear. In this work, a hob tip radius of 0.044 in. was used to provide a gear root radius of nominal print dimensions. Assuming linear-elastic material response, the gear bending stress is proportional to applied load. Therefore, the analysis was done for one load case only and stresses for any load case found by linear scaling. For the loads used in the experimental part of this study some plasticity had to have occurred on a local level where the calculated linear-elastic stresses (in the range of 290 to 650 ksi) exceeded the yield strength of the material (290 ksi (ref. 4)). Therefore, the stresses reported should be considered as stress-based indices of load severity, and the term “pseudo-stress” has been adopted to highlight the distinction. An example of the predicted distribution of maximum principal stress for the test specimen is shown in Figure 7 . 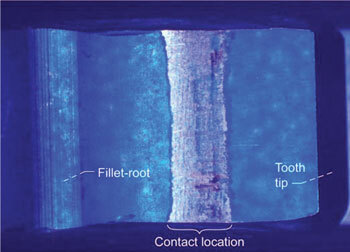 A 4000 lb normal force produces a 379 ksi pseudo-stress maximum at the fillet-root region. A total of 29 fatigue and crack propagation tests were run. The data from these tests are shown in Table 4 and Table 5 . In Table 4, normal loads for the fatigue tests are listed. The fatigue test loads ranged from approximately 3000 to 5000 lbf compression (noted as negative load in the tables). In Table 5 , a single load of increasing amount was applied using stroke control until the gear failed. The single 1/4 cycle load to failure ranged from approximately 5850 to 6900 lbf. 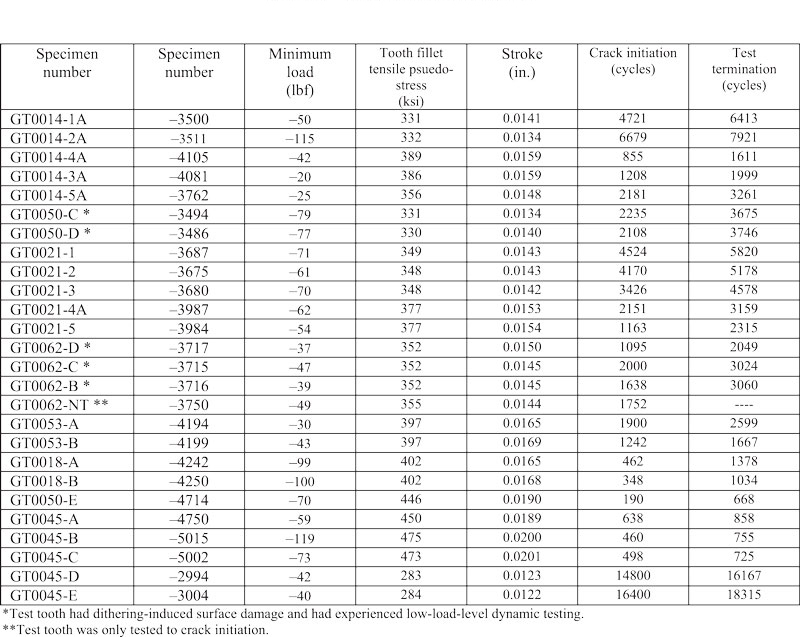 Table 4 provides the initial stroke (total deflection of load rods, gear test and reaction teeth), the crack initiation cycles and the number of cycles to test termination. The specimen number is related to a particular gear and the tooth tested on that gear. 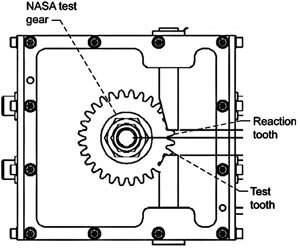 The test fixture and gear design permitted up to five teeth to be tested on a single gear. The fillet pseudo-stress values shown from each test were based on proportional scaling of the maximum applied load to the load applied in the finite element model results mentioned earlier. Table 5 provides data for three tests conducted for single load to failure (1/4 cycle). These tests were conducted on previously untested gear teeth. The maximum bending stress is shown in the table (calculated as previously described) along with an equivalent load capacity of load per inch of face width. The tooth fillet region pseudo-stress ranged from 554 to 654 ksi and the load per inch of face width ranged from approximately 23000 to 27000 lbf per in. of face width. For the data of Table 4 , five of the tests were on gears that had been previously tested for another potential failure mode known as dithering. Dithering is small relative motion between meshing gears that can exhaust the contact of lubricant and cause fretting wear and fretting fatigue at the contact locations. Dynamic (rotating) testing was done on test specimens having dithering-induced damage for millions of stress cycles (at a low level of fillet stress, in the range of 30 ksi). Five teeth with dithering-induced damage were tested during this research using the single-tooth bending method. These five tests showed that the bending fatigue strength was not compromised due to the fretting on the gear flank surface. The gear teeth failed at the usual site in the root and fillet region and not at the location of the dithering-induced damage on the active flank of the tooth. This indicated, based on the relatively low number of tests conducted, that a bending failure would not occur from a dither-damaged surface. One of the teeth tested had both fretting damage and contact-fatigue pitting damage present prior to single tooth bending testing. Testing of that gear resulted in fatigue cracks through the case in both the root-fillet region and on active flank where pitting was present. For that tooth, the cracks in the fillet region were larger than the crack in the pitting region. 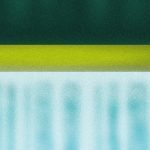 For purposes of the present research, it was assumed that the dynamic testing done at low levels of load on teeth with dither-induced damage did not represent any significant fatigue damage. That is, the low-load cycles were not included in the cycle-counting for purposes of reporting the data. All the data generated in this study for bending fatigue are shown in Figure 8 . Remember that the testing was unidirectional and that the fillet pseudo-stress values are stress-based indices of load intensity based on linear-elastic material response. Test termination data are plotted in Figure 9 . For the range of 200 to 20,000 cycles, the relationships of stress to cycles for crack initiation and to cycles for test termination were found to be semi-logarithmic. The relationship of load intensity to crack propagation cycles (defined as the difference of crack initiation cycles and test termination cycles) is shown in Figure 10 . There is a linear relationship between level of stress and the cycles for crack propagation. In other words, lower load level resulted in a lower percentage of total test cycles for crack propagation. A series of single tooth bending tests have been conducted on AISI 9310 spur gears. Tests were conducted from 1/4 cycle to thousands of cycles. 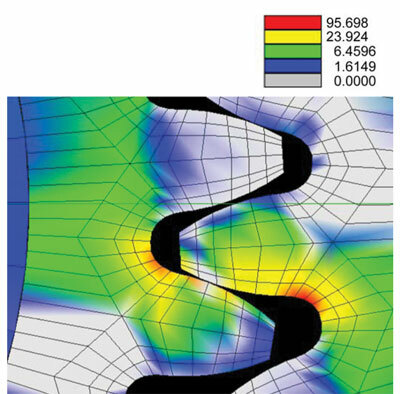 The tooth fillet region stresses reported were calculated using a linear-elastic finite element model. The reported values for tensile stress exceeded the known yield properties of the material for a small volume of material in the root-fillet region, and therefore the reported stress values should be considered as a stress-based index of load intensity. 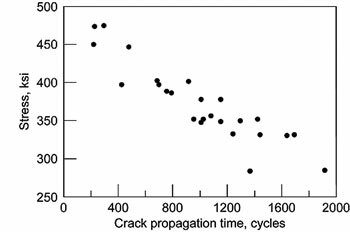 Testing produced cycle versus load relationships for crack initiation and crack propagation. When tests were terminated, the crack size as visible on the tooth side face was approximately 30 to 50 percent of the distance across the tooth thickness at the tooth base. 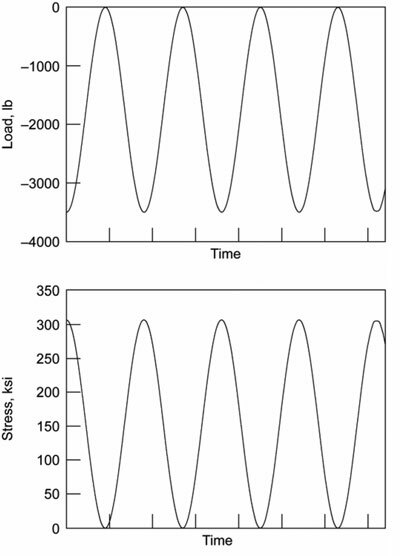 For the range of 200 to 20,000 cycles, the relationship of stress to crack initiation cycles and to test termination cycles was found to be semi-logarithmic (linear trend of stress versus log (cycles)). The relationship of stress to crack propagation cycles was found to be linear. For the range of loads investigated, the crack propagation phase is dependent on the level of load applied, and can be a relatively small part of the total test time (order of 100 percent) for the lower load level used in this study. 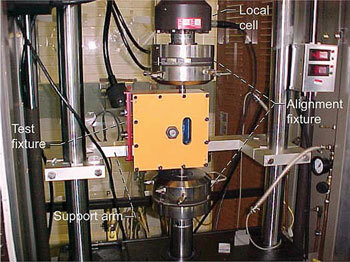 The crack initiation data could be used to validate methodology for fatigue life evaluations. The crack propagation data could be used to validate methodology for damage-tolerance evaluations. 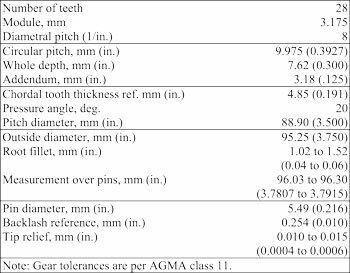 Five fatigue tests were done using gear teeth having dithering-induced surface damage on the active tooth profile. The fatigue crack location was at the usual position in the root and fillet, not at the dithering-induced damage location. For these five tests, the dithering-induced damage did not reduce the bending fatigue capability of the gear tooth. 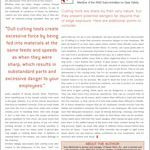 1) Fundamental Rating Factors and Calculation Methods for Involute Spur and Helical Gear Teeth, ANSI/AGMA 2001-C95, October 1994. 2) McIntire, W., Malott, R.; “Advancement of Spur Gear Design Technology”, USAAVLABS Technical Report 66–85, U.S. Army Aviation Materiel Laboratories, Ft. Eustis, Virginia, 1966. 3) Heath, G., Bossler, R.; “Advanced Rotorcraft Transmission (ART) Program—Final Report”, NASA CR-191057, ARL–CR–14, 1993. 4) Krantz, T.; “The Influence of Roughness on Gear Surface Fatigue”, Ph.D. Thesis, Case Western Reserve University, Cleveland, Ohio, USA, 2002; also NASA/TM—2005-214958, ARL–TR–3134, 2005. 5) Townsend, D.; “Surface Fatigue Life and Failure Characteristics of EX53, CBS 1000M, and AISI 9310 Gear Materials,” NASA TP 2513, 1985. 6) Townsend, D.; Chevalier, J.; Zaretsky, E.: “Pitting Fatigue Characteristics of AISI M 50 and Super Nitralloy Spur Gears,” NASA TN D–7261, 1973. 7) Krantz, T., Kahraman, A.; “An Experimental Investigation of the Influence of the Lubricant Viscosity and Additives on Gear Wear,” NASA/TM—2005-213956, ARL–TR–3126, 2005. 8) Handschuh, R., Morales, W.; “Lubrication System Failure Baseline Testing on an Aerospace Quality Gear Mesh,” NASA/TM—2000-209954, ARL–TR–2214, 2000. 9) Lewicki, D.; “Crack Propagation Studies To Determine Benign or Catastrophic Failure Modes For Aerospace Thin-Rim Gears,” Ph.D. Thesis, Case Western Reserve University, Cleveland, Ohio, USA, 1995, also NASA TM-107170, ARL–TR–971, 1996. 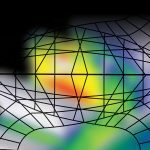 10) Dempsey, P.; “Integrating Oil Debris and Vibration Measurements for Intelligent Machine Health Monitoring,” Ph.D. Thesis, University of Toledo, Toledo, Ohio, 2002, also NASA/TM—2003-211307, 2003. 11) Vijayakar, S.; “Multi-body Dynamic Contact Analysis Tool for Transmission Design – SBIR Phase II Final Report,” ARL–CR–487, 2003.
has worked as a research engineer at the NASA Glenn Research Center since 1987, first as an employee of the U.S. Army and presently as an employee of NASA. He has researched many topics to improve power transmission components and systems, with an emphasis on helicopter gearbox technologies and space mechanism components. He is past-Chair of the ASME Power Transmission and Gearing Committee, a member of the AGMA Helical Gear Rating Committee, and a member of the Industry Advisory Board for the NSF’s Smart Vehicle Concepts Center. He has supported several projects for the NASA Engineering Safety Center including the Shuttle Rudder Speed Brake Actuator, the Shuttle Body Flap Actuator, the International Space Station Solar Alpha Rotary Joint, and the James Webb Space Telescope. 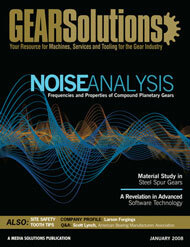 is with the QSS Group, Inc.
is with the National Aeronautics and Space Administration, Glenn Research Center. 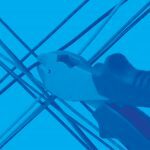 has over 30 years of experience with NASA and Department of Defense rotorcraft drive system analysis and experimental methods. He serves as the Chief for the Rotating and Drive Systems Branch at NASA Glenn Research Center in Cleveland. 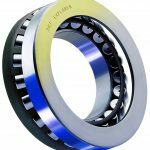 He has recently led research at Glenn in high-speed gearing, including windage, loss-of-lubrication technology, and hybrid gearing. Handschuh is credited with successfully developing many experimental research test facilities at Glenn and has conducted testing in the following areas: high-temperature, ceramic seal erosion; blade-shroud seal rub; planetary geartrains; spiral bevel gears and face gears; high-speed, helical geartrains; single-tooth-bending fatigue; and high-speed gear windage.